"All of us have come, I and my team consisting of 32 people, the relatives of sailors, we have come to support them at the court hearing due on April 17," Denisova told 112 Ukraine TV channel, noting that Ukrainian consuls told her that the sailors were in a good mood. "Now I will go for a meeting with the EU representative in Russia, I will ask him to appeal to the ambassadors and the European countries’ diplomatic mission in Russia so that they visit the court to support the sailors," she said. "Besides, we will discuss the EU steps, including of the mission, which is here, on releasing our sailors. 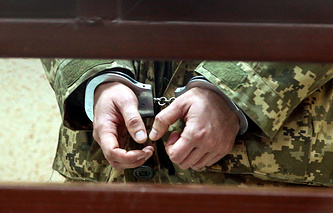 Pressure should be increased, then Russia will be forced to release the captives." On November 25, three warships of the Ukrainian Navy violated the rules of passage through Russia's territorial waters while en route from the Black Sea to the Azov Sea. The Russian side had to use weapons to compel the ships to stop. Three Ukrainian servicemen were lightly wounded. They received medical assistance. The ships were detained and escorted to the port of Kerch. A criminal case was launched on border violation charges. Moscow described the incident as a provocation.